Drawn to the Page is a new creative partnership project between New Writing South and three major art centres in the South East; De La Warr Pavilion, Jerwood and Towner Galleries. One Saturday a month, we’ll be joining forces to give you a unique writing experience in an art exhibition. Join New Writing South in October at Towner for the exhibition Twixt Two Worlds which showcases selected works and artefacts from local museum collections exploring early British cinema, photography and moving image. You’ll be exploring the exhibition and learning more about the art on display with writer and artist, Wendy Ann Greenhalgh, as your guide. 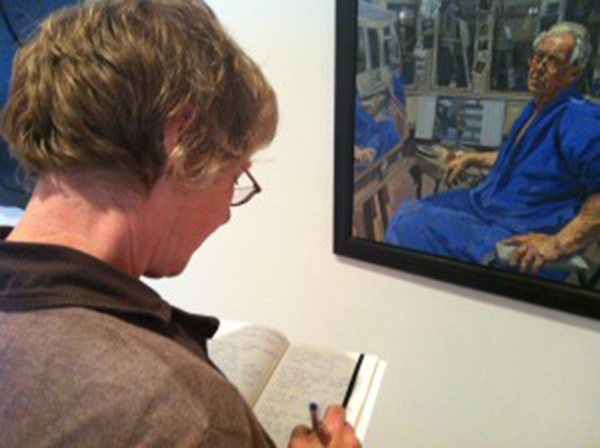 Fun and revealing creative writing exercises in prose, poetry or autobiography will get you thinking like the artists and developing your own creative responses to the paintings and drawings on display. You’ll have three hours to write, discuss and be creative – and still have time for a cup of tea afterwards too. Entrance to the exhibition is included in the price of the workshop ticket – and all you’ll need to bring is your notepad and pen. All writers who attend these workshops will have the opportunity to publish their writing on the Drawn To The Page blog – which will be updated monthly. This is one of a series of ongoing workshops as part of the Drawn To The Page partnership. With three art galleries to choose from, you’ll have the chance to explore a different exhibition, new artists and a variety of mediums on a regular basis. From painting and drawing to photography and installation art – there’ll be something for all tastes. And with a new selection of creative writing exercises monthly too, you’ll never write the same thing twice. Drawn To The Page will be at De La Warr Pavilion, Bexhill on 15 November and Jerwood Gallery, Hastings on 6 September 2014. No previous knowledge of either art or writing is necessary to enjoy these workshops.